We have moved on swiftly from recording our heart rate manually and jotting down our calorie consumption and a record of our daily exercise. A fitness watch has it all, it can keep a record of pretty much your every move. Most fitness watches have a GPS function which for runners and cyclists works wonders, as it can record distances accomplished, all while reading your heart rate, all while estimating your calories burnt. Having a heart rate function is a great way to monitor your heart rate during rest and at its peak, HIIT (high intensity interval training) is a popular way to burn fat quickly and uses heart rate to monitor your intensity. Your heart rate can reach a fat burn %, then can further reach a cardio %. Most fitness fanatics love to monitor their time spent at each interval level. The fitness watch has a built in pedometer which constantly monitors your step count for the day, and even vibrates or alarms once a step count goal is met, this function is great for keeping your days consistent. 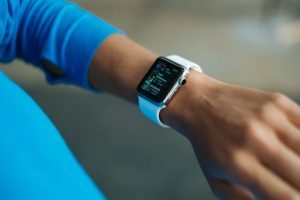 Most fitness watches can be synced with any smartphone and if you download the compatible application, all of your data can be transferred without you doing anything. The Apps are a great way to be able to visualise your fitness progression, as many good Apps provide graphs and weekly summaries for each area, from steps walked to time spent exercising. Most of the Apps also include a food diary entry section, where you can input any food consumed, and record the amount of water drank in 24 hours. A fitness watch is a great investment if you are into fitness or if you are looking to start a new fitness lifestyle this coming new year, whichever it is they are a great way to track you progress. Comments Off on Press printing made easy. Small businesses are able to cut down the price of custom designed clothing by branding their products at home rather than sending them to a factory to do the work for them. A press printing machine can be purchased and can be worth the money in the long term to save on using printing companies. Owning your own press printing machine allows you to print at any time of the day and help meet stressful deadlines. A press printer is a device that allows pressure to be applied to an ink surface upon a print medium such as a t-shirt or vest, this transfers the ink, allowing the clothes to be branded with words or images. Press printers can be very bulky and require a lot of space to be stored though there are some cheaper and more compact models on the market, such as those that allow you to transfer printer paper to clothing. You will need a standard inkjet printer and transfer paper for this type of machine and you treat the process as if you’re printing a standard poster or document. Once you have the design in place, just use your inkjet printer to print out the design onto the transfer paper. Then you can apply the transfer onto the t-shirt in the correct place and iron it into the material. This simple solution is one of the easiest ways to personalise your clothing, but of course there are many more high-tech machines on the market. Take the Loge A3 printer as an example, it is specifically designed for bulk printing onto t-shirts. This is a pricier machine and not one that will fit beneath your desk at home or at work, but it will allow you to print greater volumes at faster speeds. Comments Off on Is design easier than ever before? Is design easier than ever before? Technology is constantly evolving but there are many traditional marketing and advertising methods that have hardly changed. Brochure production is one of them, and while it’s quicker to print brochures and leaflets, you still need a professional designer to make it just right. Or do you? There are many third party websites that includes software to allow you to create you own brochures using a theme, and it means the design is already in place, you just have to go in and add your content. It’s nice for small companies who want to cut costs on using an expensive designer, but its not going to work so well for medium and large businesses. Why? Well, with a large team you may have strict brand guidelines you have to work to, keeping everything consistent and you’ll need a designer who can meet your expectations. There are many great designers out there, but many of them claim to be great yet deliver poor results, so be sure to pick carefully. We must say, we’re pretty impressed with the new Amazon Tap, a wireless portable Bluetooth speaker. Why is it different from other speakers on the market right now? Well, firstly being made by Amazon gives it a huge boost, but the best feature is the microphone button. Simply press this once and you can ask for music from Prime Music, Spotify, Pandora, iHeartRadio and TuneIn. The device uses the Alexa Voice Service when connected to Wi-Fi or a mobile hotspot to play music but you can also keep busy by getting it to read you the news, provide weather reports and even order a pizza! Now you’re listening right? This powerful speaker is more than just a speaker, it’s a smart speaker that makes your life easier, but in terms of sound it delivers 360-degrees of omni-directional audio and provides up to nine hours of playback. What more would you want from a portable speaker? Laser engraving machines are more efficient than conventional laser engravers. Unlike the traditional models, modern laser devices do not require the user to replace the engraving tips regularly while using the device. The user can control the engraving process via a computer program. The laser beam accurately traces the patterns on to the particular surface after directing the laser beam at the surface of the material to be engraved. Customers should know how to differentiate the quality laser engraving machines from cheap imports. The company you purchase from should be reliable and provide you with all the support you may need before and after purchasing the laser engraver. The machine should have all the quality features you need. Such a brand will not break easily and will reduce the need to repairing the machine, as often. Ensure your laser engraver can be upgraded. The manufacturers and supplier should also provide you with the necessary tutorials for using and fixing the machines. The company also needs to have a good website. The technical support should also make sure that all questions from the customers are answered as timely as possible. You should also ascertain whether you can get the replacement parts easily. The power of the laser engraver and the size of the bed are two primary issues that the buyers should never overlook. The bed size of the machine determines the maximum size of the material that can comfortably fit in the machine for engraving or cutting. A larger bed allows the user to engrave or cut larger pieces and perform small activities such as laser cut jewellery. Some laser machines have a bed that can move up and down while others have a fixed bed. The user should examine the power of the laser precisely. The user can measure the strength of a laser engraver in Watts. Powerful lasers feature more watts. You can start with a 30W laser and then upgrade to 50W or more. The strength of the machine is crucial when cutting a piece of material. Laser engravers may consume a lot of space. You must ensure you have enough space for the laser cutter. You may also need a ventilation equipment and cooling equipment while using your engraver. Speed defines how fast the laser lens can move in the X and Y directions over the piece of material. Laser engravers with higher speed complete projects within a very short time. Laser engravers may require some maintenance. You must make sure you have all the necessary skills needed to perform the necessary maintenance. You can refer to the user’s manual provided by the manufacturer. In summary, modern laser engraving machines come with all the features discussed above. Only buy your laser machine from certified and reputed dealers. You should also ensure that your dealer has tested your laser engraver for efficiency.